Location: Orchard Hills staging area, Irvine. From the north, take either the 5 or 405 Freeways to Culver Drive. Head northeast for a total of 2.8 miles (from the 5 Freeway) or 6.1 miles (from the 405 Freeway). 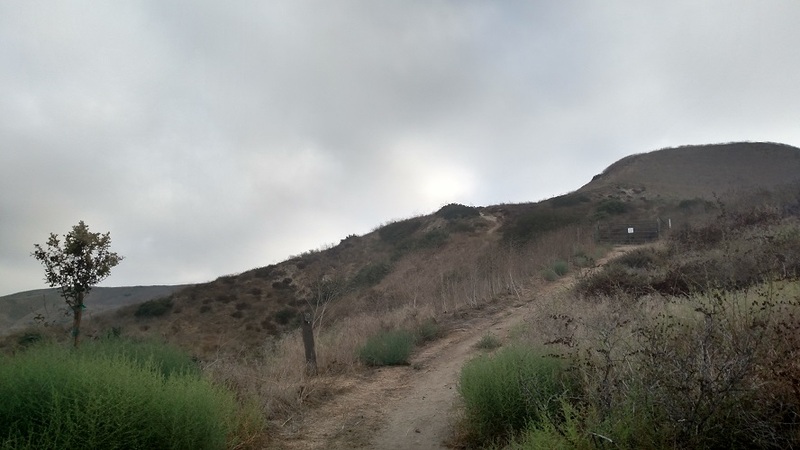 The entrance to the trail head will be on the left side of the road, 0.8 mile past the intersection with Portola (there is no traffic light or sign, so keep an eye out; there will be a volunteer from the Irvine Ranch Conservancy at the gate to check you in). Alternately, from south Orange County, take the 5 Freeway north to Jeffrey Road. Turn right and head northeast for 2.4 miles to Portola Parkway. Go 0.9 mile and turn right onto Orchard Hills. The trail head will be on your right in 0.9 mile. You must be registered for all activities on Irvine Ranch lands. Registration is free and can be done online via the link below. In 1857, the infamous Flores Daniel Gang, also known as “Las Manillas” (handcuffs), committed a string of robberies in south Orange County. Sheriff James Barton rounded up a posse to capture the gang, despite warnings that he was outnumbered. Barton was ambushed and killed near what is now the Irvine Spectrum. In retaliation, a much larger posse was assembled. Two members of the Flores Daniel Gang were captured and hung on a sycamore tree in a shallow ravine in the Santa Ana foothills. Drivers on the 241 toll road pass by the site – possibly without having any idea of the otherwise bucolic area’s violent past. 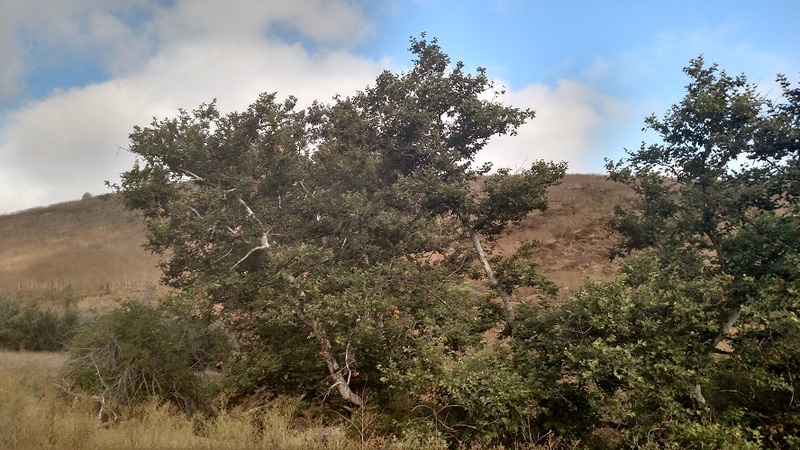 The challenging Hangman’s Tree Monument hike is a longer version of Irvine Ranch Conservancy’s popular Orchard Hills Loop. While the Orchard Hills Loop is offered several times a week, the Hangman’s Tree is usually only offered once or twice per month. Additionally, while the Orchard Hills Loop is often done in the evening, the Hangman’s Tree hike is scheduled for early mornings to avoid the heat. Thus, if you have already done the Orchard Hills Loop as an evening hike, participating in a Hangman hike will allow you to experience the trail during a different time of day. The exact route may vary; some guides will opt for a straight out-and-back through Orchard Hills while others may follow one or two of the loops. These variations may result in slight differences in elevation gain and distance, but anyone who signs up for one of these hikes should be prepared for a workout (the Conservancy rates it a 4 out of 5 for difficulty). The pace may vary depending on the abilities of the group. From the trail head, follow the guides as they lead you through the trails of Orchard Hills. 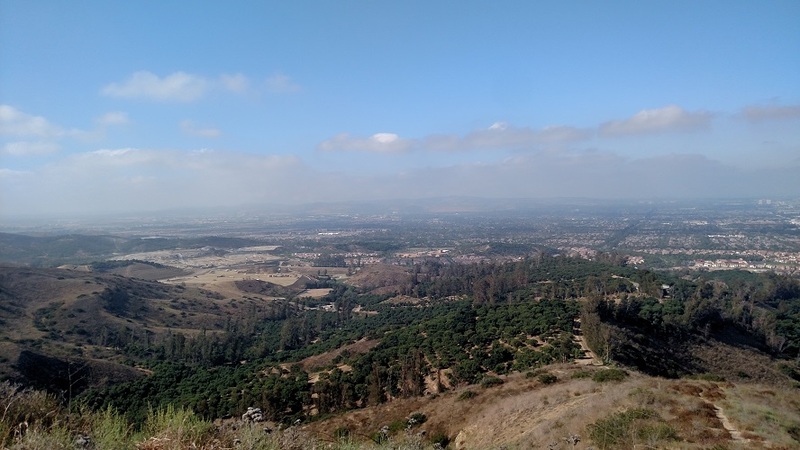 Both routes weave through avocado orchards and make steep climbs to a vista point (1.2 to 1.6 miles from the start, depending on the trail). This is the high point of the Orchard Hills Loop and the beginning of the extension to the Hangman Monument. The most difficult part of the hike awaits: a short but very steep (350 feet of elevation gain in 0.3 mile) climb up a loose single-track, the Changala Pass Trail. As you climb, your efforts are rewarded with increasingly panoramic views of Orange County’s suburbs. The grade eases a little bit as the trail merges with the West Loma Fire Road. A more moderate ascent (200 feet in 0.5 mile) brings you to the highest point of the hike, about 1,200 feet above sea level. 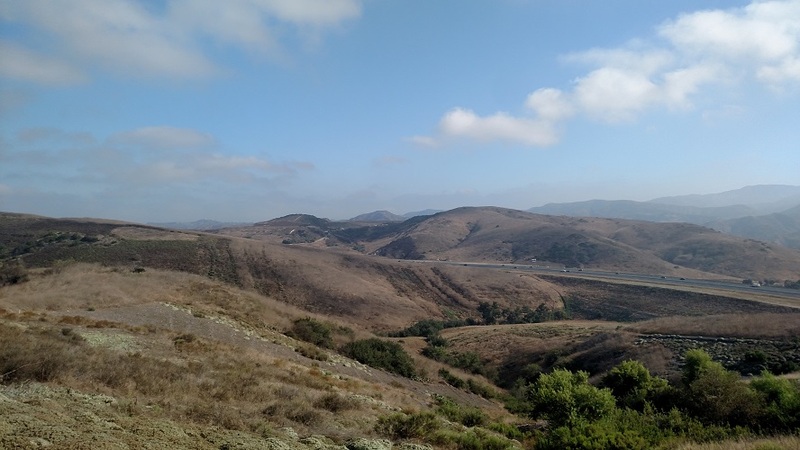 Here you get a panoramic view of the Santa Ana Mountains and the 241 toll road. The trail descends 0.3 mile to a junction with an overgrown but easy to follow spur leading 0.1 mile to the monument. The southernmost sycamore (on your left as you face the grove) is the one from which the men were hung; the branch appears to have broken off from the tree but close inspection reveals that it is still intact (as of this writing.) The monument was erected in 1967 but was forgotten, left to be taken over by mustard plants and other invasives. Ironically, the 2007 Santiago Fire helped the monument get rediscovered as it burned the brush around it, revealing it to a new generation. This is the turnaround point for the hike. A significant amount of uphill awaits you on the return, although the hike is usually started early enough in the day that the heat still shouldn’t be too bad. From the top, retrace your steps back down the fire road and the steep Changala Pass before returning to the Orchard Hills Loop and following it back to the parking lot. Juan Flores (after whom Flores Peak in Modjeska Canyon would later be named), who took over leadership of the gang after Pancho Daniel was injured in the fight with Sheriff Barton, escaped the first wave of lawmen that came after him but he was captured soon afterward in present-day Simi Valley. While he was awaiting trial in Los Angeles a vigilante mob broke him out of prison and hung him. Pancho Daniel was also caught and hung in November of 1858.